Stay in school, kids. That’s what we say, right? An education is important! The Macalope’s just not sure if Harvard is making the best case for it. No, no. Sure. That makes sense. No reason to be dazzled by the fact that it’s a record quarter... for every company ever in the history of forever. Nah. There are probably very subtle cracks in Apple’s armor that are there if we only have the eyes to see them, right? Apple’s record Q1 earnings report may have led some consumers to believe that the “old” Apple is back. Please enjoy this Hostess untreat, which features a fluffy cake of “Duh?” surrounding a disgusting filling of “Wuh?” First of all, we’re supposed to presume that some consumers believe there was an “old” Apple and a “new” Apple. Second, these mythical consumers further believe that the “old” Apple is now “back” because of Apple’s financial results. Do these mythical consumers exist? The Macalope says no. Partly because the setup is absurd, but also because he’s a mythical creature himself and he’s never seen any of them at the mythical creature meetings. A fundamental tenet of disruptive innovation is that established firms normally do not react to disruptors. You can see this coming up Clown Street. Clown Avenue? Clown Boulevard. 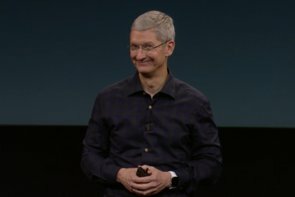 We’re about to be told how Apple’s failing to react to a disruptor. First two rows may get sprayed in the face with a seltzer bottle or hit with a shaving cream pie. In a smartphone market that is growing at a healthy rate of over 25%, data indicates that Apple had lost 2% of market share in the last three years. Market share. Really, when you’re arguing for Apple doom, what other metric do you have? None. Literally not one other metric. So at a strategic level, what Apple has done is what incumbents usually do: adopt a disruptor’s technology (Samsung’s and Xiaomi’s, mainly) to sell more to its premium customers. But Apple’s always sold to the premium market. If selling to the premium market is not disruptive then Apple never was. Despite these record numbers, though, the process of disruption continues. Xiaomi and other disruptors still eat away at the low end with business models that are capable of monetizing their products much more effectively than Apple. Let’s see if we can unravel this ball of logical yarn that has seemingly been twisted up by a kitten with some kind of motor-reflex disorder. Apple just reported the best quarter in the history of any company by taking the most lucrative part of the market. But Xiaomi is somehow “capable of monetizing [its] products much more effectively” because it sells cheap devices. Well, it’s not like a race to the bottom never went wrong cough… netbooks. Apple used to revolutionize industries, announcing record sales numbers because it had introduced a new technology, feature, or product that we had never imagined but that, when we saw it, we all instantly wanted. That Apple seems no longer present. We can argue all we want about the Apple Watch but we won’t know how revolutionary that will be until it ships. But how about Apple Pay? Naysayers harp that it lacks loyalty rewards or will tumble before the CurrentC juggernaut. Apple Pay is a perfect example of Apple doing exactly what it does so well. NFC terminals sat largely dormant at checkout stands across the U.S. until Apple Pay launched. Now it takes up $2 out of every $3 spent on contactless payments. (Of course, we only talk about market share when Apple’s losing it.) And the reason is because it’s so darn easy to use—exactly what CurrentC isn’t. Apple took an existing market and reinvented it by making it easy and pleasurable to use. Just like it did with desktop computers, just like it did with digital music players, just like it did with smartphones, just like it did with tablets, just like it did with socks that you put digital music players into. OK, maybe not that last one. What’s more, by dazzling us with dollars, it seems that Apple’s leaders are deliberately trying to divert our attention. It’s a fair question here as well. Are you on dope? Look, we’re not trying to be judgemental, we’re just trying out the only explanation that really makes any sense because you just suggested Apple was obfuscating by reporting its quarterly financial results. The numbers are big because Apple is incredibly, historically successful. Sorry if that’s confusing for you, writer for the Harvard Business Review.